These muffins were discovered on the first day of RA training, when, after a long 12 day, I discovered I had some super ripe bananas I needed to use. I searched google for gluten free vegan banana muffins... and discovered these. They are based on a Rachael Ray recipe. The recipe I found had made RR's recipe GF, so I tweaked it a bit more to make it sugar free. BOOYAH. I whipped this recipe up in my dorm and then baked them in the oven on the second floor lounge. Try these on for size. Put those fat pants away, ladies. No guilt here! 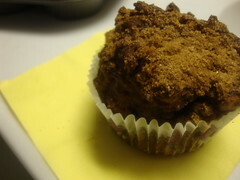 Optional topping: Sprinkle each muffin with cinnamon sugar before baking, if you don't mind the sugar. It makes them extra delicious. You could try a blend of stevia and cinnamon, although I've never tried that. Let me know how that goes if you do try the cinnamon stevia! Preheat the oven to 375°. Line a 12-cup muffin pan with baking liners. In a large bowl, whisk together the flour, stevia, baking powder, baking soda, xanthan gum, salt, cinnamon, pecans, and raisins. In a small bowl, beat together the banana, Mimicreme, and flaxseed meal with a fork. Stir in the oil. Stir the wet ingredients into the flour mixture until just combined. Fold in chocolate chips (if using). Fill the lined muffin cups with the batter. Sprinkle with cinnamon sugar, if using. Bake for approximately 20 minutes.